Please refer my answers and open to any corrections. It is for scope of learning corporate finance. In broad terms, why is some risk diversifiable? Why are some risks non-diversifiable? Can Investor control the level of unsystematic risk in a portfolio? In business perspective, risks are categorized into 3 levels. They are risks at firm level, industry level and global level. At firm and industry level, investors can diversify their risks in their portfolios by investing in variable companies so if a bad management or wrong strategy of a company will not affect harshly investor’s wealth. The same principle applies to risks that industry bare. For instance, the downturn of mining industry cannot affect investor portfolio if it just holds a few percentages. Economic crisis is known as systematic risk which investor cannot control at any level. It is also called the market risk which investors are willing to bear if the reward is attractive enough. Since unsystematic risk can be diversified, investors have power to avoid heading into those risks by not giving money to asset or securities that are unlikely to improve over time. In other words, Investor cannot directly control the unsystematic risk such as bad management, wrong strategies or industry’s recession but they can stay away from it and as the result, company who wants to get investment must perform well. Short-term interest rate increase unexpectedly. The interest rate of a company pays on its short-term debt increases unexpectedly by its bank. A manufacturer loses a multimillion-dollar product liability suit. Suppose the government announces the economy growth of this year is 2% compared to 5% for the year just completed. Will security prices increase, stay the same or decrease? Does it matter if the 2 percent figure was anticipated by the market? Explain. The price of securities of coming year will change if the market did not fully anticipate prior to the announcement. The price will rise if the anticipated growth rate below 2% and vice versa. The government announces the inflation unexpectedly jumped by 2 percent last month. The directors of Big Widget die in a plane crash. Big Widget’s quarterly earnings report, just issued, generally fell in line with analyst’s expectations. The government reports that the economic growth last year was 3 percent, which generally agreed with most economists’ forecasts. Congress approves changes to the tax code that will increase the top marginal corporate tax. The legislation had been debated for the previous six months. Question: If the portfolio has a positive investment in every asset, Can the Er > every asset in the portfolio? Can it be less than on ever asset in the portfolio? Explain. Answer: No to both questions. 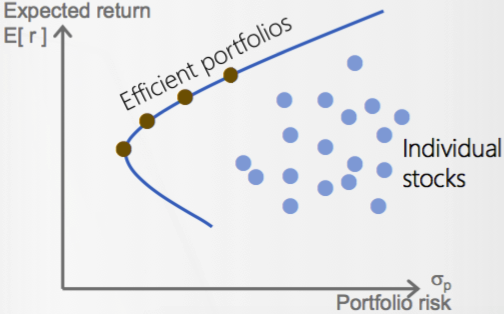 The expected return of portfolio is a weighted return which is greater than the smallest asset return and smaller than the largest asset return. Question: The most important characteristic in determining the Er of a well-diversified portfolio is the variance of the individual assets in the portolio? Answer: According to text book, variance is the measure of total risk which includes systematic risk and unsystematic risk. A well diversified portfolio return rewards investor who bear systematic risk which is literally measured by Beta and variance is just a function of systematic risk only. Question: If the portfolio has a positive investment in every asset, Can the STD on the portfolio be less than that on every asset in the portfolio? What about portfolio Beta? Answer: STD is risk of asset. In a portfolio, STD can be less than the smallest asset risk. Beta of portfolio cannot be less than the smallest beta because it is a weighted average of individual asset betas. Beta and CAPM. Is it possible that a risky asset could have a beta of zero? Explain. Based on the CAPM, what is the expected return on such an asset? Is it possible that a risky asset could have a negative beta? What does the CAPM predict about the expected return on such an asset? Can you give an explanation for your answer? Beta can have zero value if the asset return equals return of risk-free asset. It is also be negative when the asset return is less than return of risk-free asset. CAPM estimate the future return of stock market which is influenced by the economic growth and inflation. As earning announcement concerns past period and earning accounting, why are they relevant to future expectation of stock value and cash flow? The earning announcement is important to the expectation of the future stock value because it shows whether the actual figures are in line with economists’ predictions. If the actual figure is greater than the anticipated value (forecast), the price will rise and vice versa.